This graphic is making the rounds. It reminds me of a rant I threw down in 2004. If you're buying or downloading pirated movies, this will make you feel better. Watching full DVDs has become a process of popping it in, do a few little things like making your snacks... then plopping on the sofa when the movie is actually ready to play! Or you can just watch 'em in the theatre and have makeout sessions during previews. 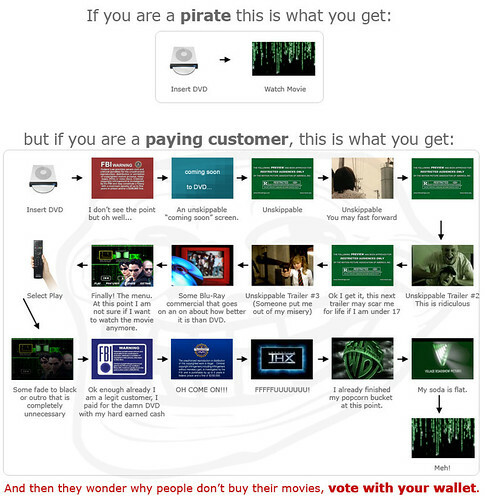 I'm actually not big on pirated movies. Not because I'm against it, or anything. The other stuff just doesn't really bother me. I did a project on DVDs back in 2000/2001, and I found out that it's built into DVDs that the first "title" isn't skippable. I think the intention was originally for the FBI warning, but some people use it for the annoying stuff. LOL, never seen it laid out so plain as this, cemented my argument with my other half now I believe, thanks Mike. I haven't watched a legit DVD in about a year as my time is precious and wading through the pre crap is just a waste of 7 minutes of my very little viewing time. Hmmm..don't know what is so hard about hitting the fast forward or skip button on your DVD remote. What I get from this post is that people would rather give thieves money. The point of the image Anonymous, is that many DVDs don't allow you to skip the previews and such. That function (as The Voice points out) is not available for the 1st track on the DVD, so any content put there is non-skippable.